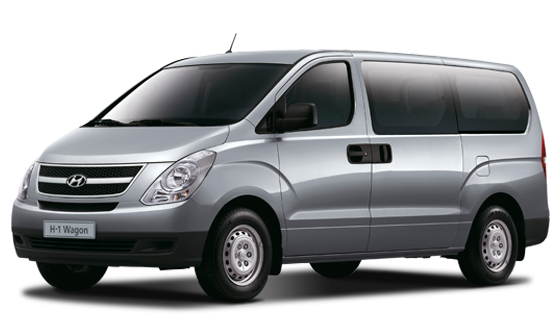 Hyundai H-1 | HYUNDAI - NEW THINKING. NEW POSSIBILITIES. 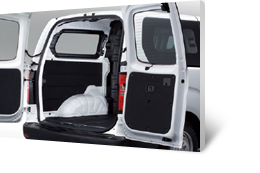 For maximized racticality, van comes with twin swing gate at the rear while wagon is equipped with standard hatch-style door. The wagon versions feature a pair of fog lamps, which are neatly blended into the lower section of the front bumper. For maximised practicality, customer can choose twin swing gate at the rear as an option in the van model. Good radio reception in all areas is virtually certain thanks to the standard fitting of a roof-mounted aerial. The multi-seat wagon versions of the H-1 are available with flush-fitting side windows for improved aesthetics and quietness. A touch of class is added in most markets with an attractive chrome finish to the now traditional Hyundai grille. The top model wagons are available with this attractive side garnish between the wheels. These durable steel wheels are standard equipment across most of the range. Increased wheel sizes help to reduce running costs. There are more neat design touches on the fascia panel for the controls for the fog lights and the rheostat. A console in the roof serves as a drop-down container for a pair of sunglasses and some map-reading lights. The interior mirror of the wagon is an electronic chromatic type that automatically dips when dazzled by a following vehicle’s headlamp main beams. The cabin can be illuminated by a choice of six ambient colours thanks to the roof-mounted LED-type interior lamp. In the twelve-seater version of the wagon, the bench for the fourth row of seats tips up and slides to yield more space for luggage. Whether the operator selects the 2.4-litre multi-point injection gasoline engine or 2.5-litre variable geometry turbo diesel, the H-1 delivers excellent performance and fuel economy. 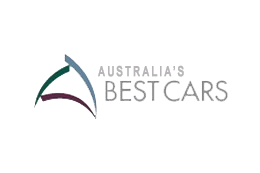 According to model and market, the vehicle features a five-speed manual or optional automatic transmission. For optimum weight distribution and dynamic balance, the front-mounted engine powers the rear wheels. 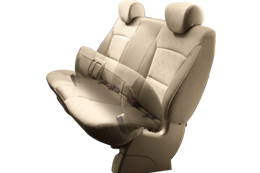 Passive safety features include a sturdy body/chassis unit, a full complement of air bags and optional anti-lock brakes. good fuel economy and shift feeling. 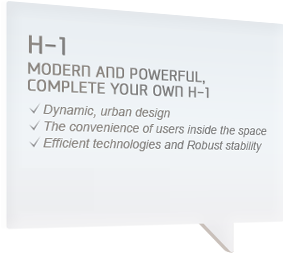 Manoeuvres made easy Tight spaces in city centres or on country backroads are no problem for the H-1 driver. Despite having a length of more than five metres, the vehicle’s turning circle is no more than 5.6 metres. around you and you will immediately see small but significant quality of details.